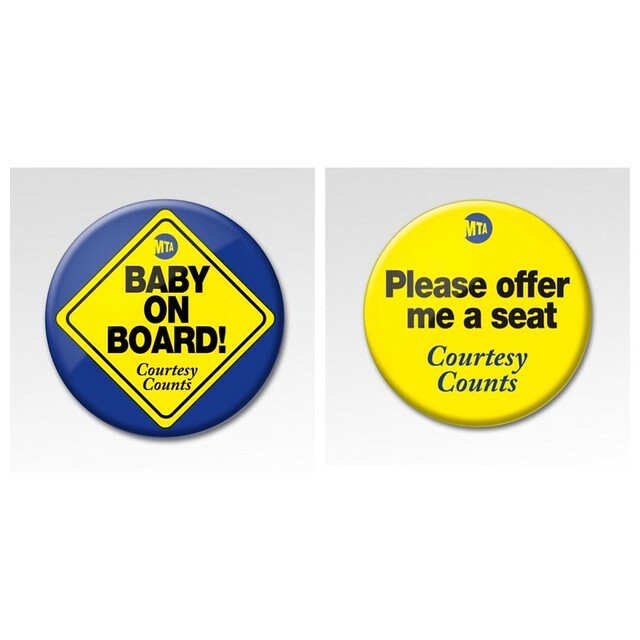 Pilot Program Offers Free ‘Baby on Board’ and ‘Please Offer Me a Seat’ Buttons; Campaign Modeled After Program Used in London; Among First in the U.S. The Metropolitan Transportation Authority (MTA) today launched a new awareness campaign to encourage customers to move their feet and offer a seat for pregnant riders, seniors and those with a disability who are seeking seats. The pilot program, which begins on Mother’s Day and runs through Labor Day, will examine ways to encourage courtesy by helping riders easily identify fellow customers with specialized needs who need a seat. MTA already provides disabled customers “priority seating” on buses and trains; while riders are required to relinquish seats in those areas under federal regulations and MTA rules of conduct, the new courtesy buttons can help riders better identify which customers need seats. The campaign also encourages customers, as a matter of courtesy, to give up any seat – not just those in reserved “priority” areas – to customers wearing an MTA-issued button. Customers who are pregnant can choose from a “Baby on Board” button or a “Please Offer Me a Seat” courtesy button, which can also be worn by customers who have disabilities and seniors who choose to wear them. The MTA will distribute buttons to all users of our system and the initiative will be integrated into our existing courtesy campaigns via transit system advertisements and social media. “Pregnant riders, seniors and those with disabilities often need seats more than others but their condition may not always be visible,” said MTA Interim Executive Director Ronnie Hakim. "We hope this campaign will help their fellow riders to be more willing to offer them a seat without having to ask a personal question first. “While we continue to designate ‘priority seating’ for riders with disabilities, this is another way to expand the availability of seating for those who need it most,” Hakim added. Health officials and advocates for transportation and disability praised the initiative as a positive way to help disabled riders and spread awareness that not all physical conditions are clearly visible. “A little courtesy goes a long way. Providing a seat to a special needs user, without having an awkward conversation, can make a big difference with a small gesture,” Veronica Vanterpool, Executive Director of the Tri-State Transportation Campaign and MTA Board Member said of the initiative.? "I'm glad the MTA is launching this pilot campaign to remind its customers of priority seating while also explicitly including pregnant women and older adults to the group of special needs transit users." “The MTA has the ability to change norms around what it means to accommodate and support pregnancies and families on public transit in the United States. ?This pilot program represents a positive step toward doing so,” said Christine Serdjenian Yearwood, the founder and CEO of UP-STAND, an advocacy group that supports ways to accommodate pregnancies and families through the use of such buttons. "We've seen these kinds of accommodations work to make public transit more accessible for pregnant riders in European and Asian countries. We're thrilled to see the MTA introduce this pilot program for New York residents and to partner with them toward improving accessibility." The MTA’s Ronnie Hakim noted that the awareness campaign is part of broader efforts to make the system more accessible. Transport for London has had a similar program for the London Tube since 2005, with approximately 130,000 of the badges distributed every year. It started with a “Baby on Board” pilot, which was later followed by a pilot for disabled customers. Dutchess of Cambridge Kate Middleton brought international attention to the program when she wore an official “Baby on Board” button in 2013. The awareness button pilot announced today is considered to be the first of its kind in the United States and marks the first time MTA, which runs the largest transportation system in North America, is using buttons as part of a courtesy campaign. Anyone with a disability (whether temporary or permanent) affecting their need for seating may request one button by filling out a form at http://mta.info/courtesy. Buttons will be to be mailed in approximately three weeks. There is no fee or documentation required. Third parties may also participate in the distribution of the buttons. For more information, visit http://mta.info/courtesy. As with London’s system and many other MTA “Courtesy Counts” messages (such as “Don’t Be a Pole Hog” and “Stop the Spread”), this awareness campaign will be self-enforced and not linked to any penalties. People wearing the buttons are encouraged to help spread awareness by posting selfies with the hashtags #BabyOnBoard and #CourtesyCounts. Customers are reminded that seats marked “priority seating” are, in accordance with law, designated for riders with disabilities; it is not only discourteous for a person without a disability to occupy those seats when a disabled person requires a seat, it is a violation of the Transit Rules of Conduct.